Well, as you know, we had a pretty crappy weekend recently, and luckily for us, the next weekend offered plenty of distractions. Cute W’s parents came into town for a visit just in time to see J’s last chorus concert of the year, and then the next morning Cute W and I headed out of town to visit Grinnell College. We met on the first day of school there–we lived across the hall from each other–and over the course of a year and a half or so we went from acquaintance/hall mates to very good friends to a mutual crush. This was our 25th reunion as well as our 25th anniversary. Historically I have not been a big fan of reunions. So far I’ve been to a 10-year high school reunion that was super-depressing(long story) and a 5-year reunion that I thought was pretty meh (I am not as much of an extrovert as I wish I were). Plus we were basically exhausted from the previous weekend and ensuing emotional fallout. So expectations were low. But it was really, really fun. 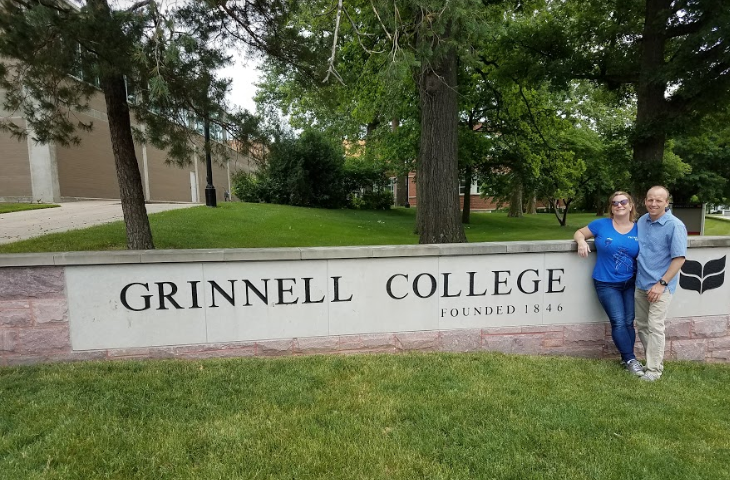 It takes a particular sort of personality to decide you want to attend a small liberal arts college in the middle of nowhere, so it feels like you pretty much have something in common with everyone. Plus many of our core group of close friends came, and we don’t get together nearly enough. So it was wonderful to see people. Apparently it’s sort of a weird thing that our college reunion is a whole weekend (with an optional alumni college that could make your stay closer to a week) and that we all stay in the dorms. It seemed perfectly logical to me until I told people and they seemed surprised. Yep, our dorm was filled with people from our year, they put up a big tent and tables and chairs for a party space outside, and there was a full program of events that I mostly missed because I was either socializing and drinking or recovering from socializing and drinking. 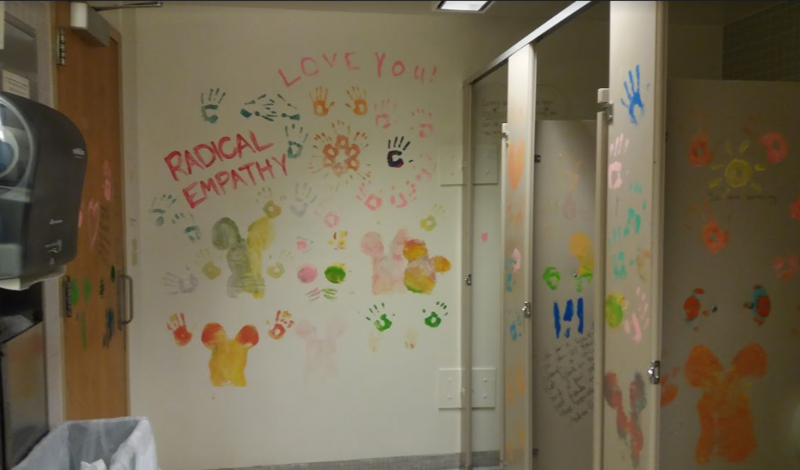 We wandered the rather-too-fabulous campus clucking over how spoiled today’s college kids are, but we still managed to find old familiar places, like the lounge where Cute W and I first kissed and the library bathroom that is famous for its uplifting girl power graffiti. We also danced, danced, danced like crazy, which I love. On Friday a special year-specific dance party went until 2 am, deejayed by a campus favorite from days of yore who’s now a music executive. 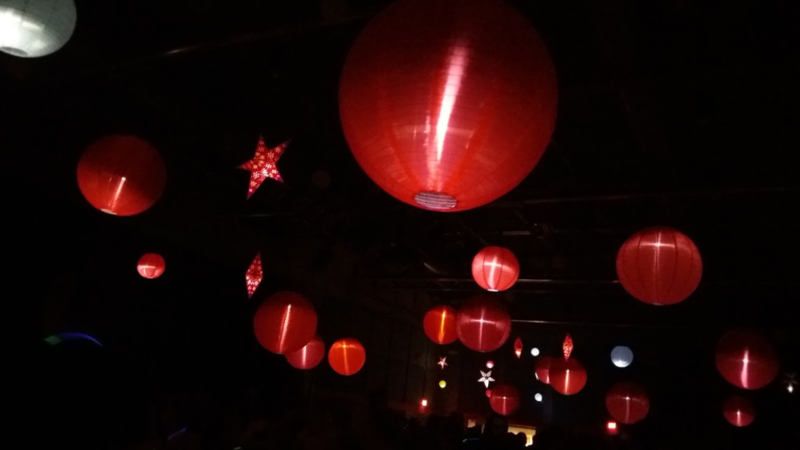 On Saturday there was yet another dance party with music selections that were almost as good in a party space that was lovely and festive. It was also just fun to reconnect on a weekend that was sort of an extended blast-from-the-past date. Was there a little bit of making out on the dance floor? It’s possible. So, it was fun. Also exhausting. Between catching up on work and catching up on sleep and saying goodbye to Grandma and Grandpa, we’re just about recovered a week later. M is considerably more relaxed now that she’s knocked out several of her finals, including the two that were her toughest topics. J is reaching the coasting stage at school, which included a field trip to the Bronx Zoo yesterday. As it happened, this timing was especially fortuitous because, as you may have heard on the news or from the school itself, there was a lockdown yesterday. Actually, yesterday wasn’t great. I’ve been feeling really unwell–I think it’s allergies–and the news is always a source of sorrow, more so than the usual unrelenting political horror because of random very nice celebrities committing suicide. Then we got a call to pick up Isis’s remains from the vet, and that turned out to be slightly more horrible than I anticipated. Shortly after that we started getting notifications about the lockdown, and as the afternoon progressed we’d get more and more updates and see more and more cars piling into our neighborhood as worried parents waited outside the school. The kids were not in danger, as it turns out, but there is something so fundamentally wrong about the whole situation. A beautiful Friday afternoon and these kids were cowering in a corner of their classrooms until roughly 7 pm. It turns out that if you feel physically sick and you bring home your cat in a small canister and you are constantly reminded of the danger that our country’s schoolchildren face, it is a recipe for a lot of sobbing. Which only exacerbates that whole phlegm-overproduction issue. Well, in any case, this weekend is pretty special because it is the first weekend in 14 weeks (14 weeks!) that doesn’t involve travel or a sports competition (and many of those weekends included both). We celebrated by having friends over last night, and then we’ve got a block party later today, and J’s heading off to a birthday party. So we’re going to keep chugging away and keep trying to get the laughter to outpace the tears.